The ECB (European Central Bank) just had its 20th birthday. But there is really nothing to celebrate. The EU is in a total mess and the Euro which was launched on January 1, 1999 is a failed currency. Every President of the ECB has had to deal with fires that had very little to do with price stability but were more a question of survival. Most of these fires were a lot more serious than the candles in the Euro cake on the left which Draghi is trying to blow out. During the French ECB Trichet’s watch, he had even bigger fire to blow out which was the Great Financial Crisis that started in 2006. The only mandate of the ECB is to maintain price stability. Well that clearly has been a very costly exercise. Between 2006 and 2011 the ECB balance sheet trebled form €1 trillion to €3 trillion. But the crisis didn’t finish in 2011. After a brief reduction in debt, the balance sheet expanded fast from €2.3 trillion in 2014 to €4 trillion today. It is quite remarkable to watch the creation of a supranational bank which automatically creates a purpose for its own existence in the form of massive money printing. This is no better than burning money and serves no purpose whatsoever. And it is of course far distant from its purpose of price stability. Money printing creates high inflation and eventually hyperinflation. The only reason why we haven’t seen high conventional inflation in the EU is that all the printed money, just like in the US, has stayed with the banks. The result has been low inflation in consumer products but huge asset inflation. Thus, we have seen massive increases in stock, bond and property prices but not in consumer prices. So major money creation by the ECB and the Eurozone banks have so far had only minor inflationary impact. But as the velocity of money increases so will inflation. This moment is not far away. The same will happen in the US. As velocity of money accelerates US inflation will pick up rapidly. The EU now has major economic and/or political problems in many countries. Italy’s new coalition government is a protest against the EU and Euro. With debt to GDP already the highest in Europe, the new regime will exacerbate the problems. Lower taxes and higher spending will guarantee that. As the chart below shows, Italian debt to GDP is already 140%. By 2050 this is projected to grow to 210%. As interest rates go up, servicing the growing debt will soon absorb all tax revenue. 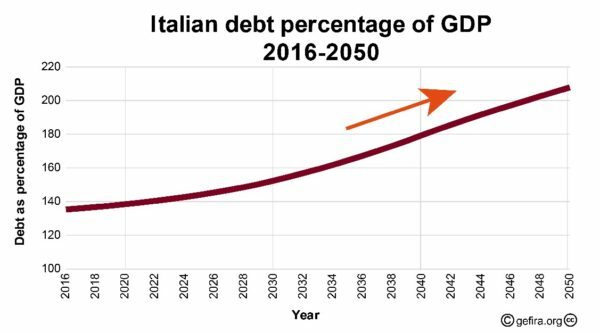 Italy will be bankrupt long before 2050 and default on all its debt. 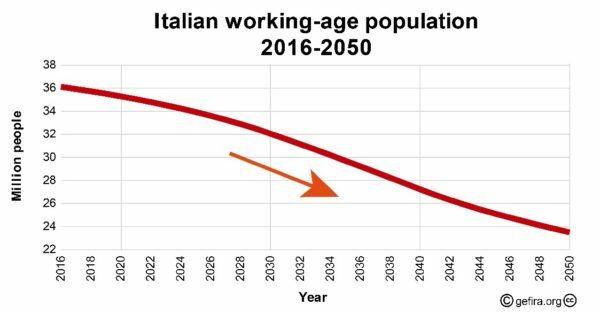 Between now and 2050, the Italian working age population is forecast to decline by 1/3 form 36 million to 24 million. There will be a lot less people to pay for a much higher debt. 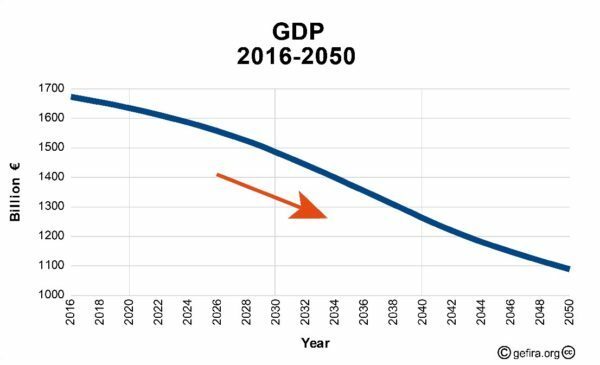 The consequences of massive debt, economic stagnation and population decline will be a much lower GDP which is expected to go down by 35% by 2050. If the above forecast of a major fall in the population and GDP as well as a substantial increase in debt is even vaguely accurate, Italy is on its way to the Dark Ages. I must stress here that I find it so sad that this glorious country is suffering so much already and will suffer a lot more. Personally I love Italy, the people, the food, the architecture, the history and the Giola di Vivere (joie de vivre) of the Italians. It will be so tragic to see all of this disintegrate. Hopefully it will take a long time although sadly the crisis might actually be around the corner. But Italy is just one of many countries which will collapse in coming years. Spain is in a similar situation and the prime minister has just been kicked out. Greece’s problems have never been resolved and this fine country is sadly also bankrupt and so are the Greek banks. I could go on with Portugal, France, Ireland, the UK and many others. Most of these countries have insoluble problems. It is only a matter of degree and time when the EU/Eurozone house of cards comes down. 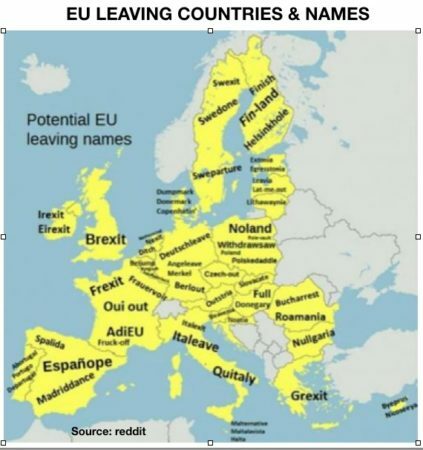 The map below shows potential leaving countries and names. Coming back to the ECB’s main objective of price stability, that has failed totally too. The change from the local currencies of mark, franc, lira, pesetas etc has disguised what has really happened. Many countries like, Spain, Italy Portugal and Greece used to be very inexpensive when they had their own currency. That is no longer the case. The change to the Euro has hidden the real inflation that has taken place in these countries. No wonder the Germans called it the TEURO. Teuer in German means expensive. The consequence of one currency fits all is a disaster for the weaker Eurozone countries like Italy, Greece, Spain, Portugal etc. The Euro is much too strong for these countries. This leads to weak exports as well as balance of payment and budget deficits. Countries like Germany on the other hand, benefit from a weak Euro which generates strong exports and surpluses. But the other side of the coin is that the ECB which means mainly Germany must finance the deficits of the weaker countries. And we all know that these debts will never be repaid. So whatever way you turn, the EU experiment will end in disaster. It is only a matter of how long it will take. If Italy, Greece or Spain had their own currencies, these would have weakened substantially already. Currency debasement is going to be the major contagious disease that the world must live with in coming years. It will happen to most currencies in the world and spread like wildfire. Like many diseases it normally starts in the periphery. Just take the examples of Turkey, Argentina and Venezuela. The currencies of these three countries have collapsed in this century and the fall is now accelerating. The problem is worse in Argentina. Argentina used to have a very strong economy 100 years ago but lately they have gone through one crisis after the next. The Argentine Peso has lost 99% against gold since 2000. This means that gold is up 119x vs the peso in this century. Finally let us look at the perfect example of a disastrously managed socialist economy with the resulting hyperinflation. I am talking about Venezuela of course. The Venezuelan Bolivar has lost 99.999% against gold since January 2000. So the Bolivar is down 550,000x against gold in this century. This all might sound unreal. These three currencies have lost between 97% and 99.999% in just 18 years. Well, it certainly isn’t unreal to the people in the three countries who have to suffer these precipitous losses in the value of their money and disastrous falls in their standard of living. And don’t think for one second that their governments told them to protect themselves even when they knew they were going to print unlimited amounts. No, the people had no warning. It is the same in all Western countries today. Governments in Europe, the US and Japan, to mention a few, are already on the way to destroy their currencies in the 2000s. As the table shows, the Euro is down 75%, the Dollar 78% and the Yen 75% against gold since 2000. So inflation, leading to hyperinflation is already on the way in the West. It always starts slowly, although the fall so far in the last 18 years is already significant. We will see it in the EU, we will see it in the US and we will see it in Japan. But no government talks about how they are destroying their currency and no Western government tells their people to protect themselves by holding gold. They do the opposite. They manipulate the price of gold and see gold as a barbarous relic that has no place in a modern currency system. We know why they do this of course. Because gold can’t be printed or debased. Also, the gold price reveals their deceitful actions in ruining the currency and the economy. Finally let’s look at two countries which understand gold and where the people buy and hold gold in important quantities. So my advice to investors is to learn from the recent economic problems/disasters in Turkey, Argentina and Venezuela. Any amount of personal gold, even very small, would have saved the holders in these countries from misery. It is also now critical to heed the strong warning signs of deep trouble coming in Europe, Japan and the USA. A 75-79% fall in the currencies of these countries is telling us that they will all go to their intrinsic value of ZERO in the next few years. This will lead eventually to the same hyperinflation as in Argentina and Venezuela. IGNORE THE PROPAGANDA FROM WESTERN GOVERNMENTS AND BANKS WHO DON’T UNDERSTAND HISTORY OR GOLD. 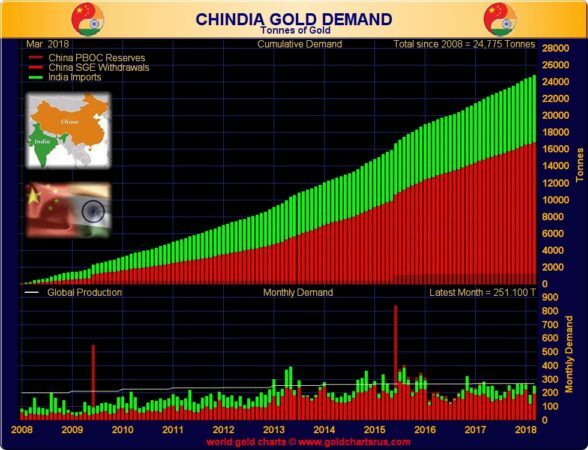 INSTEAD FOLLOW THE LEAD OF CHINA AND INDIA AND PROTECT YOURSELVES AGAINST THE COMING DESTRUCTION OF PAPER MONEY, WITH PHYSICAL GOLD AND SOME SILVER.